Photo for illustration purposes only. Items may vary due to later developments. JonSpeed Racing Ltd are pleased to announce that development of the Eaton SuperCharger Kits has now been completed for carburettor Mini's. (Including 998 / 1098 & 1275 up to 1360cc). Power is increased by approx 60%, but the best part is the fantastic drivability and consistent torque. Please specify engine spec when ordering so that the correct carb parts & compression plate are supplied. The Kit Includes the Following. Inlet Manifold, LCB Exhaust Manifold & gasket. Modified crank pulley & aux drive belt + tensioner + tensioner tool. Carburettor Pipe + HIF44 parts. Decompression Plate + 2 head gaskets. Universal Throttle & Choke cables. Sealed Timing Cover Pulley + Gasket. We recommend that a 2 core radiator, Facet Fuel pump and oil cooler added for optimised performance + cooling. The kit may be fitted to any carburettor mini engine up to 1360cc. Please ensure that you send your engine specification when ordering to ensure that we send the correct carb parts & decompression plate. (Kit 1 would include compression ratio modifications to the cylinder head ilo compression plate) Please allow 3 days for fitting. Power Figures for 1340 and standard 998 link below. We also stock a large range of second hand spares as well as any new classic mini part. Check out my other items. Be sure to add me to your favourites list. The following postcodes or places. PH HS ZE IV KW PA20 88 KA27 KA28 , NORTHERN IRELAND, THE ISLE OF SCILLY & THE ISLE OF MAN. Please ask for a quote. 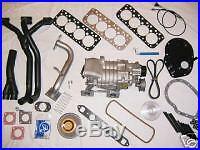 The item "SuperCharger Kit 1 for Classic Mini's. (Carb Models)" is in sale since Wednesday, February 28, 2018. This item is in the category "Vehicle Parts & Accessories\Car Parts\Other Car Parts". The seller is "jonspeed4minis" and is located in Nuneaton, Warwickshire. This item can be shipped worldwide.